For the new cover, we wanted a more upbeat tone that highlighted Bulosan’s unerring hope for America even in the face of hardship. While we were in the process of thinking about a new cover image, UW Press senior designer, Tom Eykemans, happened to spot this mural in Seattle’s International District. 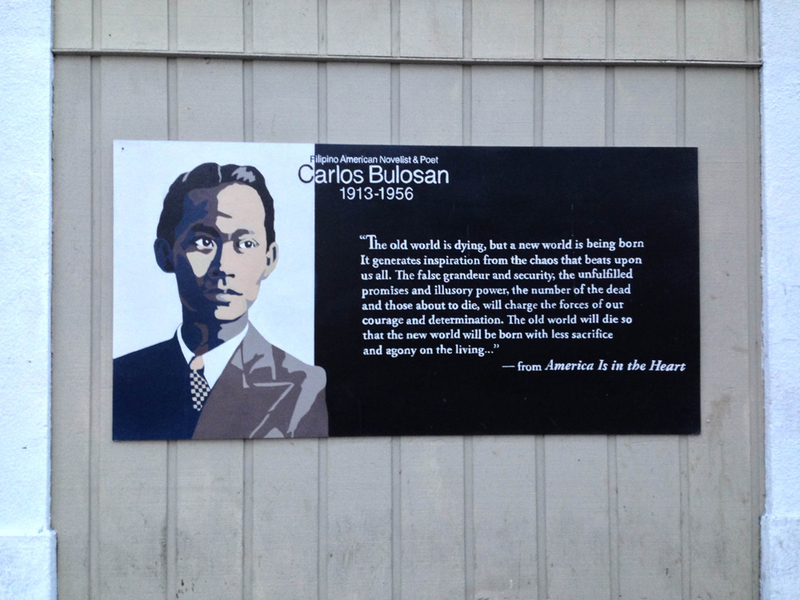 The mural had recently been installed by Urban ArtWorks and was based off of a photograph of Bulosan that showed more optimism and nuance than the illustration used for the book’s previous edition. Carlos Bulosan. Property of MSCUA, University of Washington Libraries. The more optimistic expression in this mural fit perfectly with the direction I was hoping to take the new cover design. 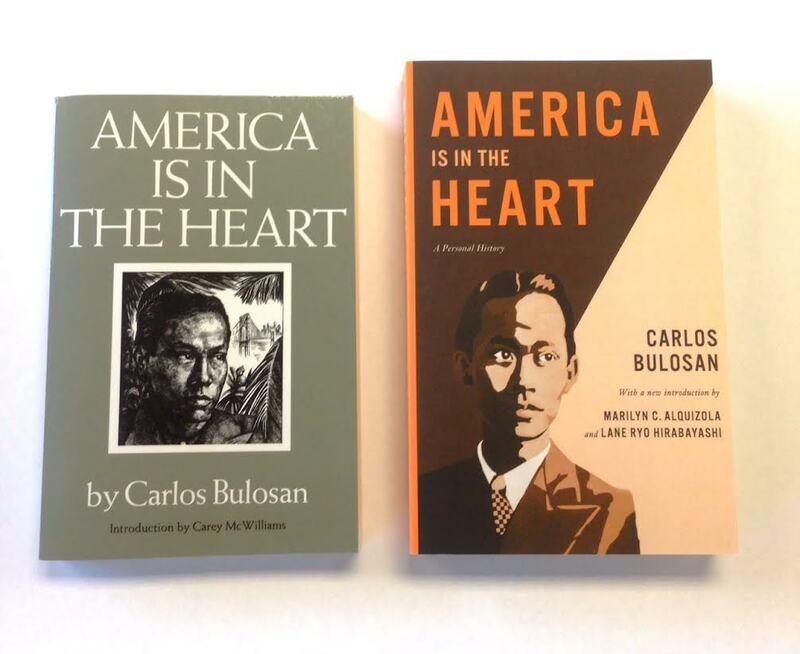 The iconic image of Bulosan, modeled off the undated portrait at right, speaks to the duality of his life and work, as well as his legacy. At the time of his death he was largely forgotten as a writer. He was ostracized, yet hopeful in the face of many adversities; disenfranchised, yet prolific in channeling his discontent in creative and proactive ways. I switched the image’s color palette to warmer tones, rather than staying with the cool color palette the mural uses. The cool tones work well for the place the mural is installed, but I was concerned it would make the book less inviting and unintentionally repeat the somewhat sinister effect of the shadows we saw in the reprints of the 1973 edition. 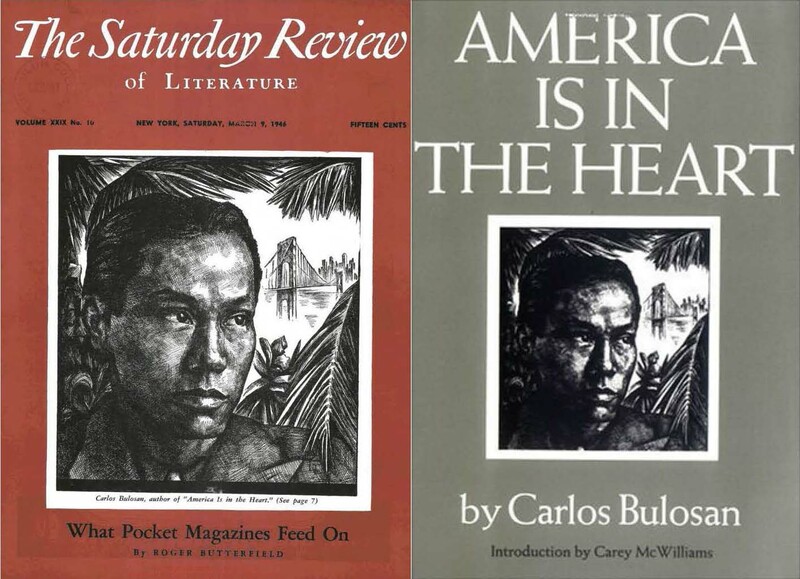 The 1973 edition of “America Is in the Heart” (at left) and the 2014 edition (at right). The collaborative nature of this cover is also in keeping with the spirit of Bulosan’s life and work. Urban ArtWorks’ mission to empower young people and restore communities through public art makes the use of the work all the more appropriate considering Bulosan’s efforts to promote social justice through his own art. We owe a big thank you to everyone at Urban ArtWorks for letting us feature the mural on the cover. Thanks especially to Kathleen Warren and the artists who painted the mural: Brendan Lattin, Javar Lawrence, Emily Taibleson, Sarah Morse, Mia Folkins, Prezley Graza, Justin Dollarhide, Collin McBreen, Darris Rhoads, and Janet Hoffman. We also thank former UW Press graduate fellow, Marites Mendoza (now at the Wing Luke Museum), who put us in touch with Urban ArtWorks.